Man, I've been so out of the PvP Arenas that I totally didn't catch this from the patch. Apparently, you can rent PvP gear from the vendor. Check it! I got my chopper!!! just kidding!!! I wish! That's me on the motorbike for the Flame Leviathan encounter. It's fun spreading the oil and picking up the healer and dps when they get thrown off the boss. Zoom Zoom. Probably as close as I'll get to getting a chopper of my own. Last night I had this spontaneous twitter contest when I found an un-opened pre-paid 60day card on my shelf when clearing out stuff. I dunno, I just decided I wanted to do a give-away on the spot so I twittered a contest to name at least 3 of my favorite snacks. 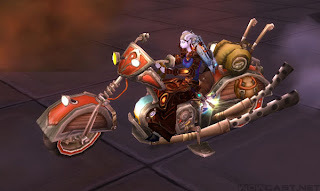 I was really glad I did the contest otherwise, I might not have gotten the heads up about Child's Play auction being hosted by one of our own WoWzens! In honor of Children's Week in WoW, Brigwyn from The Hunting Lodge is hosting an auction to help raise money for Child's Play. The post "Children’s Week Child’s Play Charity Auction Update" has Brigwyn's personal story regarding the issue. I have to definitely /salute Brigwyn for finding a way to integrate a great cause into the next fun WoW holiday event. So even if you don't get your meta achievement, you can still gain something great here. I was trying to think of something I could donate to the auction but all I could come up with was a nice gaming headset??? Not sure yet. Any suggestions? 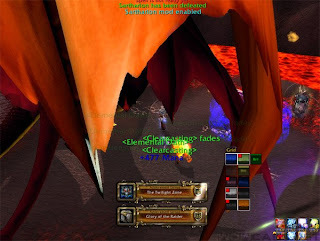 That's a pic of me on the Flame Leviathan having hopped off my motorcycle into a Demolisher and being launched because our mage died. That was the only fun I've really had on that fight to be honest. I can't say the first boss of Ulduar has me all that excited. I'm not big into siege weapon encounters yet as I don't think they offer much in terms of game play dynamics. I'd rather see group combo points added to the game to be honest. If you haven't pugged this encounter yet, it basically looks like three year olds playing soccer. A bunch of little kids rushing at a ball in hopes to lay a foot on it. It takes no skill whatsoever...just know how to spam 3 buttons at cooldowns. We didn't even bother doing it without one tower up for our 10mans which was pretty easy. I do imagine four towers will actually take some strategy though. I'm looking forward to stepping it up to that. We did Razorscale 10man no problem and accidentally got the achievement but got toasted in Ignis's Slag pot. lol. toasty baby! I'm definitely not crying for the NERF hammer for sure. I like the challenge. In our 25man raid, we're still hitting up Razorscale. We did it last night with five healers and still didn't have the DPS to push him down but we got a lot further than we did last Friday. I'm really liking this encounter a lot for the simple reason that it's a great skill and gear check. 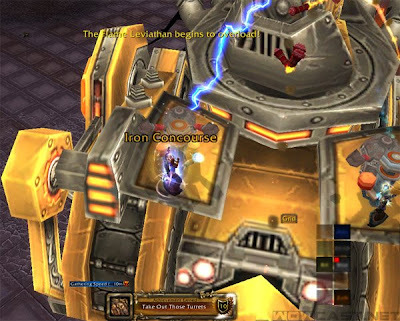 Plus it pushes progression mentality back on the raid so they understand it's not a free ride anymore. Until the raid gets better, you pay out the @ss with repairs, pots, and food. Naxx made people lazy and careless so if it takes hitting a wall for a few weeks to get people back into shape, I'm all down for that. 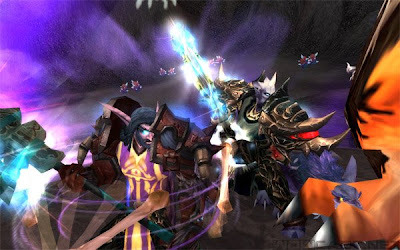 Representatives of all ten faction capitals, from Undercity to Exodar, have traveled to the tournament grounds to find champions among their heroes who will prepare for the inevitable battle against the enemy of all living beings, the Lich King. haven't heard too much about what this will actually entail but I suppose we'll find out soon enough! Finally we can destroy the gnomes!!! Also this bit caught my eye- New rare and epic items, tabards, pets, banners, faction shirts and mounts. Faction shirts!!! Can't wait to see those! I <3 IF shirts FTW! 2. Due to significant talent tree revisions, all players will have their talent points reimbursed. Several new spells and abilities have been added for select classes. Players will need to visit their class trainer to learn new spells. so glad I didn't bother respeccing for dailies this week. 3. Players level 40 and higher will now be able to visit their trainer to pay a one-time fee and access the dual talent specialization feature. 4. Applying a glyph no longer requires a Lexicon of Power. No more- Where's the book? WTF is the book!? 5. Gift of the Naaru (Draenei Racial): The heal has been changed to an instant-cast heal-over-time. all right! a little LESS useless. 6. Mana Regeneration: The amount of mana regeneration derived from intellect and spirit has been reduced by 40%; however, talents that allow for mana regeneration while in combat have been increased. As a result, in-combat regeneration for classes with those talents will stay the same, while out-of-combat regeneration will be lower. I defer to World of Warcast Episode 79. They said it all. 7. DK changes-- zomg. just when I thought Death Knights were confusing already, they pretty much decided to play hokey pokey with the class. You put your bone shield here, you take your magic dmg reduc out, you add your Improved Death Strike in and you shake it all about! 8. Druid- Tree of Life: Now receives 240% increased armor. You can now use Nature's Grasp and Thorns while within this form. In addition, the discount on heal-over-time spells from this talent is now active at all times, whether or not the druid is in Tree of Life form. Mana cost reduced to match the cost of Travel Form. 9. Hunters- Ammunition: All types of gun and bow ammunition now stack to 1000. All quivers and ammo pouches no longer provide haste. 15% ranged haste is now built into the hunter's Auto Shot. Sweet. I can finally stop wondering all over the cities figuring out where the hell the damn fletcher is. I'll only need to refill every 10 levels. 10. Hunters- Aspect of the Pack is now raid wide, and radius increased from 30 yards to 40 yards. Ahhh. man. no way to haze the new arcane mages anymore! no more blaming the gnome racial Flip! Whose got kings? anyone? anyone? Woot. No more having to switch the damn priest in and out of parties. 16. Priests- New Talent: Body and Soul: 2-point talent. When you cast Power Word: Shield, you increase the target's movement speed by 30/60% for 4 seconds, and you have a 50/100% chance when you cast Abolish Disease on yourself to also cleanse 1 poison effect in addition to diseases. I just liked this one cuz the new talent sounds so 80s. 17. Warrior- Titan’s Grip: While you have a two-handed weapon equipped in one hand, your physical damage done is reduced by 10%. Welcome back to Arms. lol. 18. Alchemy- You can now sometimes find Alchemist's Caches from bosses in Ulduar. Only players with an Alchemy skill of 425 or higher can loot these secret caches. 19. Cooking- A new recipe has been added to cooking trainers for making Black Jelly, using several Borean Man 'O War as ingredients. While it looks disgusting, it restores more health and mana than the highest level food. yummy. better than mage food. 20. Mining- Northrend deposits now despawn 1 minute after mining them. This change was made to speed up respawning when nodes were partially looted. That's right you @ssholes who left one Crystalized Earth on a Titainum node. you know who you are! have that enabled if it's not for you so you can modify your talents before finalizing them. Spell bars coincide with your active spec. 22. ALSO! Now with more enhanced lag features! Ultimate lag crashes and prolonged loading screens! Last Monday, we got our [Glory of the Raider] achievement with the finish of 3D Sarth 10man. It felt good to finally nab it down after the many, many, many wall run-ins we've had. We started trying for the achievement well before any of us had the gear for it. More importantly, I was glad we were able to do finish out with our group of ten. And the few guilds on our server who were able to complete 3D well in advance had the sweet luxury of picking and choosing their team. Also, I wouldn't exactly call it picking up "pugs" when you hand pick who you're bringing. The only reason I complain is that these are the same people who mock you for not being able to drop 3D with your static group. I just couldn't imagine dropping a few of our guys just to get the achievement done..it wouldn't be as sweet for sure. The whole point was that we accomplished this together. And while the victory was so lovely and a sense of relief washed over me as the little Glory of the Raider achievement popped up, I was extremely sad to look over and see that Jeppy (my dear friend from bindpoint) was not in the vent channel. For weeks he and Ejji have been listening in on our "WAVE WAVE! VOID VOID! WAVE" songs. Don't ask me why. lol. I thought they were masochists. :) But this week he fell ill and hasn't been able to get online so he missed our green lighting of the vent channel when we busted out the "F-yeah!!!" So this video is for you, Jeppy. Get well soon! Damn, I knew I should have rolled a NE hunter! I just came across the desktop today and really love it. It's a bit suggestive but the proportions and coloring are perfect. I just wish Night Elf faces really looked like this in the game instead of the freaky clown look they all have. I couldn't find the true source of the artist. I wanted to see about getting a high quality image.